Figure 9. The different joint alignments associated with conditions seen in the front leg. Figure 10. Steer exhibiting a steep or straight shoulder. Figure 11. Female with the correct amount of slope to her shoulder. is approximately 45 degrees. This angle allows for the appropriate range of motion and is usually associated with the front legs being placed squarely beneath the scapula. As the angle becomes larger, range of motion is restricted, and the result is the animal taking shorter, less efficient steps. Larger angles can also affect the knee and result in the animal being buck kneed. This condition occurs when the animal’s knee is pitched forward in relation to the rest of the foreleg. This condition can also be associated with cattle being too straight in their front pasterns. When the angle of the scapula is too small, the usual result is the animal being calf kneed. This condition occurs when the knee is positioned behind the outline created by the front leg. This condition is less damaging to the front leg function than is the buck-kneed condition. In some situations, such as when cattle are being confined on concrete, this condition may be considered more ideal as it provides more cushion for the front limb. Figure 9 shows the joint alignments seen with these conditions. the spine of the scapula are two of the most important points to consider when making this evaluation. By distinguishing these two points and evaluating their relation to the ground, a reasonable assessment can be made as to what the slope actually is. Another helpful way to visualize the slope is to imagine a line from the point of shoulder straight down to the ground. 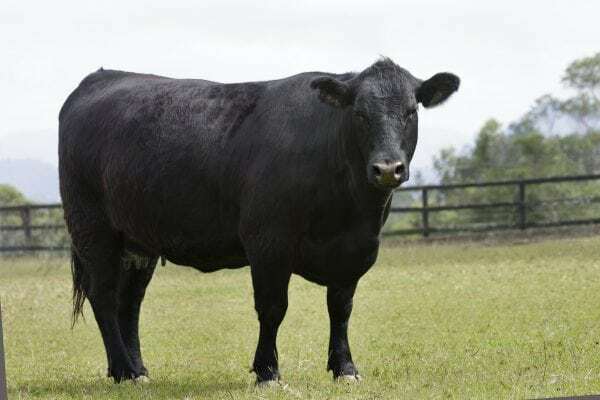 As cattle become more vertical in terms of their scapula, the line from the point of shoulder straight down to the ground will be closer to the front leg itself. Other indicators as to whether an animal is too straight shouldered include the top of the scapula being visible above the animal’s top line and shorter, more restricted steps when the animal moves. The two animals in Figures 10 and 11 are examples of some structural differences when it comes to slope of shoulder and forelimb alignment. The calf in Figure 10 is considerably more vertical in terms of slope of shoulder as demonstrated by the line connecting the spine of the scapula, point of shoulder, and the ground. The line going from point of shoulder directly to the ground also indicates a steep shoulder as it is very close to the outline of the front leg. The female in Figure 11 is closer to ideal in regard to slope of shoulder and has considerably more space between point of shoulder and her front leg.